The Success of Nonviolence – Patrick F. Clarkin, Ph.D. I just came across the work on nonviolence by the University of Denver’s Erica Chenoweth. In this TED talk, she says that she began as a skeptic about the ability of nonviolence to make meaningful change. Someone challenged her to look into the topic further, and she says she was shocked by the results. I am too, in a good way. 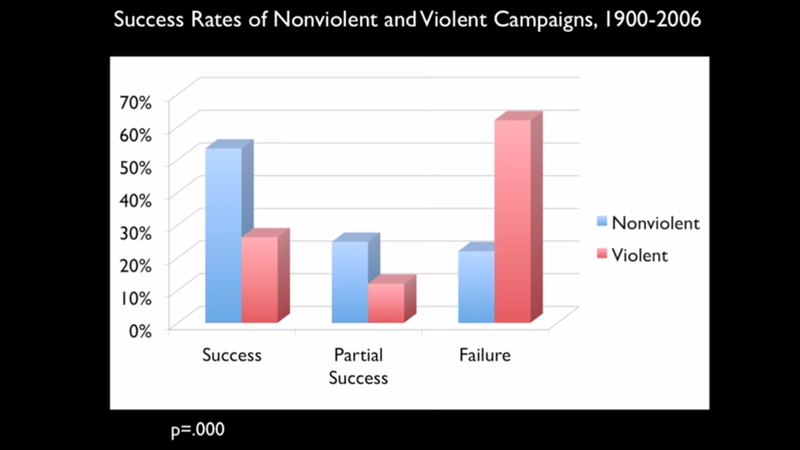 Below is the key figure from Chenoweth’s presentation, illustrating the percent of violent and nonviolent movements that succeeded in overthrowing a government or liberating a territory. It’s clear that nonviolent movements are not a panacea to reducing violence in the world. They aren’t always successful, and sometimes violent movements may be necessary. She put a hop in my step. This entry was posted in Cooperation and conflict and tagged Erica Chenoweth, Gandhi, Nonviolence. Bookmark the permalink. Keep the spring in your step, Patrick, it helps you have a pleasant walk ~and is handy if you need to run. Erica gives a nice talk. The most convincing part for me is that children at US schools could be taught more about the non-violent movement for Independence in America (supported by many in England ~kith and kin~ but not by King George) rather than glorify the military victory with public holidays etc. The same could be said for most uprisings anywhere. But does this really come down to non-violent campaigns being twice as effective as violent ones? The simple reality is that there are always both violent and non-violent campaigns in any major ‘rebellion’. They complement each other and rarely if ever appear as a clear choice of one or the other. The US lost in Vietnam and the Viet Cong won by force of arms/military tactics (the celebrated facts) but also many self-immolations (violence against self rather than others) took place in VN and the anti-war movement in the West was largely non-violent. In a pragmatic sense, revolutionaries use diplomatic and non-violent means when available and possible, until violence comes in. All major violent events (and minor, like a household dispute) have a trajectory that moves from disagreement through condemnation to resolution by violence (if not resolved on the way). The advice might better be to study the art of diplomacy along with the art of war in the hope of reducing or avoiding violence. Reduce or remove violence as an option not because it is statistically less successful than a non-violent movement (the argument here) but because it is the right thing to do. Statistical presentations are always manipulations, this one is no different. Its corollary implication is perhaps that if violent protest was more successful in achieving its aims, people should engage in violence from the outset. I see non-violence as qualitatively superior to violence and I support it for that reason, not because I think it more effective. The most effective thing to do is always nothing. I did wonder about methodology. *How* nonviolent does a movement have to be for it to be categorized that way. Dichotomous variables often dissolve upon closer inspection. And I like your point about emphasizing the superiority of non-violence, rather than its effectiveness. Ends and means. In the US, we do have Martin Luther King day, although some states fought to oppose making it a holiday, sadly. But it is a rather rare occasion to celebrate someone associated with nonviolence. There’s a lot more in the essay than just that, but this part seemed most relevant here.